I write articles for The GoDaddy Blog, GoDaddy’s online magazine and discussion forum focused on website development. My articles are targeted at both small business owners and other web professionals. Topics range from processes and tools web pros can use to run their business, to tips for the DIY crowd about managing their own sites. 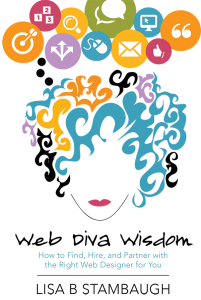 As a freelance Web Diva® with over 20 years of experience designing and developing over 675 websites for individuals, small-to-medium sized businesses, and non-profit organizations, I’ve developed processes, checklists and templates to get the job done. No stone has been left unturned in uncovering every little detail of the website design process: the best ways to approach the many tasks and challenges; the common mistakes that clients make; and the things they do that can drive a Web Diva crazy!Web Diva® Wisdom: How to Find, Hire and Partner With the Right Web Designer for You, is now available on Amazon. Whether you are ready to partner with a web designer for a new website, a redesign project or major updates to an existing site, you’ll find helpful guidelines, tips and best practices – including over 30 checklists and exercises to use along the way. As a client, you are ultimately the creator and owner of your website. If you don’t collaborate with your web designer and actively participate in the process, you won’t end up with the site of your dreams. Hiring someone to design your website should not be a one-time, short-term project, but rather the start of a long – and hopefully productive and successful – business partnership. I hope this book will become a valuable guide in preparing to get the most out of your relationship with your current or future web designer.